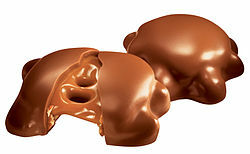 Turtles are a candy made with pecans and caramel dipped in chocolate, with a shape resembling a turtle. The name is trademarked by DeMet's Candy Company. Turtles brand candy were developed by Johnson’s Candy Company (which became DeMet’s Candy Company in 1923) in 1918, after a salesman came into the commissary’s dipping room and showed a candy to one of the dippers, who pointed out that the candy looked like a turtle. Soon after, Johnson’s Candy Company was making the same kind of candy and selling it under the name "Turtles." Today, Turtles candies come in all sizes, shapes and recipes, some even shaped like a turtle, with modern mold-making techniques, but the originals were produced by candy dippers on a rectangular marble 'board', similar in size to a contemporary kitchen cutting board. The original recipe, as executed on marble, was pecans, caramel and various chocolates; they were a multi-task confection, requiring several sittings. Pecans dipped in chocolate were commonly made in the early 1900s, however Johnson's Candy Company first protected the trademark "Turtles." In 1923, the stores dropped the Johnson name and assumed the name DeMet's, passing along the trademark. Nestle owned the brand in the USA for a time, but sold it to Brynwood Partners' DeMet's Candy Company in 2007. In 2013, Brynwood sold the company to Yıldız Holding. In Canada, Nestle uses their brand name to sell Turtles at retailers. The packaging features a mascot of an anthropomorphic turtle wearing a tuxedo and top hat. And the turtle is British..allegedly. ^ "Brynwood Partners V L.P. Acquires Turtles(R) Brand From Nestle". PRNewswire, 24 May 2007. ^ a b Newcomer, Carol. "CIRASCOPE Profile: GEORGE DEMET - Half a Century In Food Service". CIRASCOPE Profile: GEORGE DEMET - Half a Century In Food Service. Cirascope. Archived from the original on 8 May 2014. Retrieved 8 February 2012.